As a beer connoisseur, you’re likely aware of the standards and practices used by historical brewers across the globe. One practice, often referred to as Reinheitsgebot, or the “German Beer Purity Law,” has a rich history and continues to draw craft beer enthusiasts in a thirsty drove. You may have heard of Oktoberfest, the long-time celebration of beer created by the laws enacted by Bavaria in 1516. Since then, much as changed, including the technology and techniques used in craft breweries all over. As your local brew pub in Minneapolis, The Herkimer is proud to be your trusted source for high-quality food and drinks! Reserve your table today! The Bavarian beer laws in 1516 announced that three ingredients could be used: water, hops, and barley. Many experts posit that yeast was not included, as it was not known to exist at this point in time. Today, our brewpub sets the standard for flavor and purity, relying on Old-World practices to satiate modern thirsts. 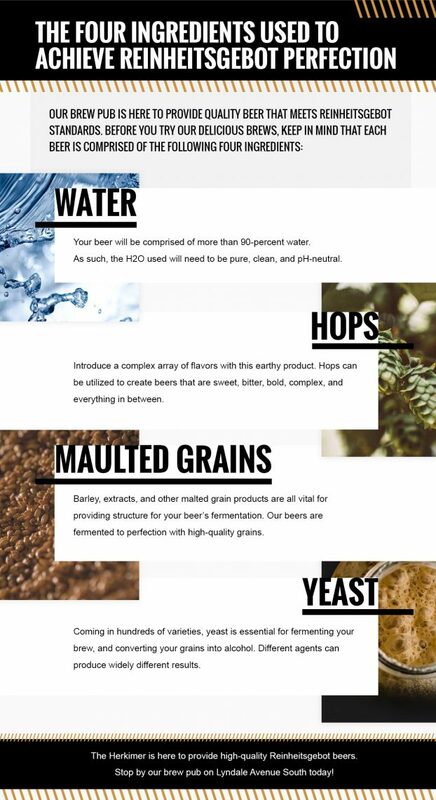 Before you try any of our flavorful beers, be sure to learn more below! pH level. If your beer is too acidic or basic, the results can impact your taste buds. This can spoil the flavor of any brew! Contamination. Even trace amounts of chlorine can play a major role in the final quality of your beer. Chemical combination. To some degree, your H2O will provide a unique flavor. Based on the balance of chlorides and sulfates, you can expect very different outcomes! The organic depth introduced into your beer’s flavor will likely be the result of the hops used for brewing. You can utilize a diverse blend of hops to create flavors that are grassy, bitter, floral, sweet, and more. Reinheitsgebot brewers can craft “pure beers” that are unique in flavor, body, and attitude. Employ a heavy amount of flavor for those that love hop-heavy brews, or go light for a crisp, clean outcome. While traditional use of barley qualifies for German Beer Purity Law, revisions in 1993 allowed for the use of powdered or ground hops and extracts. Many beers could also utilize fining agents to help purify the brew, and sugar can be included to enhance the fermentation of yeast. Barley is often used as the building block for your beer, providing carbohydrates and an ideal platform to ferment. The fermentation of sugars through the use of grains (such as barley) is an integral part of the brewing process that creates ethanol. Yeast is required during this fermentation, with hundreds of varieties available to help brewers achieve the perfect mixture. Beer comes in all shapes, sizes, and flavors, making it beneficial for enthusiasts everywhere to try local brews and develop their own palette for high-quality drinks. If you’re looking for a local craft brewery that also serves as your go-to sports bar and grill, The Herkimer is here and happy to help. Our Minneapolis brew pub is centrally located to provide high-quality Reinheitsgebot beers utilizing only the best ingredients. Contact us today to learn about our beer lineup or stop by our brewery bar to try a new flavor!